I’m hoping you won’t make me turn in my born-in-Buffalo card when I say this, but I love Boston. And that feeling dates back long before the bombs exploded on Boylston Street last year. Between vacations and work assignments, I have probably been to Boston more than any city outside Buffalo except for Toronto. So I was as floored as you were upon seeing the scenes at the Marathon finish line last year. That’s why the images across the Internet and across my television on Monday were incredibly soothing. The sun was out, the Marathon was back and the streets were packed. And like David Ortiz famously said last April, this is their, ahem, city and two hate-mongers are not going to dictate how people live. I know you all feel proud of Boston’s resilience. I also know how you feel when it comes to Boston and sports, how names like Lucic, Chara and Marchand get your anger boiling. How the Patriots are, well, the Patriots. Someone joked to me on Twitter Sunday night that the shenanigans that went on in Montreal, where the Lightning got completely hosed against the Canadiens, were just like what we’ve seen for years when the Bills go to Foxborough. I hear you. In Buffalo, you’re either for the Red Sox or against them and pretty much never ambivalent. Maybe more of you are for them than in the past now that former Bisons stalwarts John Farrell and Torey Lovullo are there and running the dugout. But there’s still so many Yankees fans here who couldn’t stand how the World Series ended last October. Even the Celtics bring some bad Buffalo sports memories, as I’m still waiting to see where Bob McAdoo fouled Jo Jo White on the final play of the 1974 NBA playoffs. If you’re too young to remember, ask your parents or Uncle Google. But I know you could all put that aside Monday. Boston reclaimed its Patriots Day and reclaimed its Marathon. 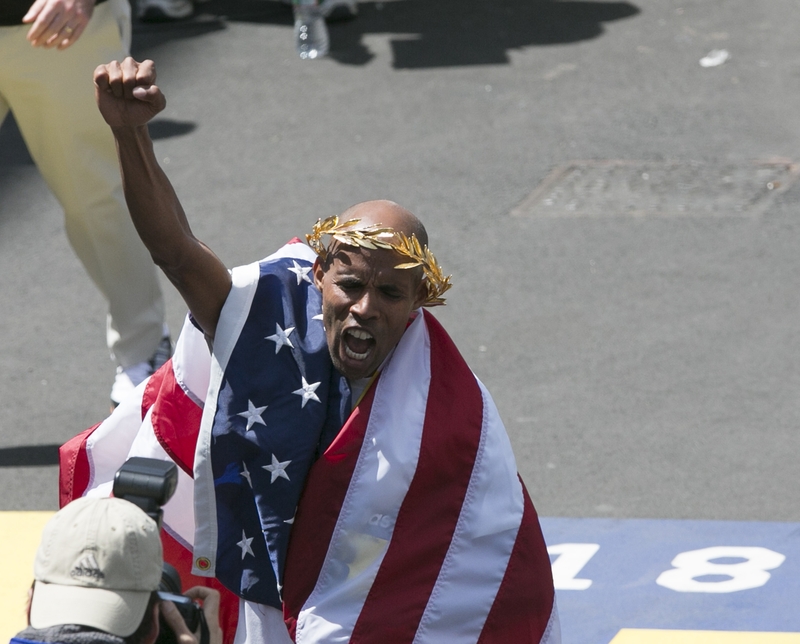 And an American male named Meb Keflezighi, who emigrated to California from Africa 26 years ago, even won the race for the first time since 1983. At 2:49 p.m. Monday – the exact time the bombs exploded last year – the race announcer asked for a moment of silence and then asked for a cheer loud enough that “they will hear it around the world.” The folks packed on to Boylston obliged on both counts. The marathon scenes were beautiful, all the way out to the start in suburban Hopkinton and winding through New England landmarks like Wellesley, Heartbreak Hill and Boston College. But it’s when they hit the city where it really took hold as the images jumped out. There was the famous CITGO sign beyond Fenway Park. The Hotel Buckminster in Kenmore Square, where Babe Ruth once lived and where the Black Sox scandal was hatched. The Massachusetts Avenue Bridge and finally the finish on Boylston Street by the iconic Boston Public Library. Of the probably millions of words I’ve written for this newspaper the last 29 years, few have generated the kind of feeling for me – or feedback from you – than my visit to the finish line last October on the eve of the World Series. It featured my trip inside Sugar Heaven, the little bulk candy store on Boylston at the site of the first blast. It was a day where I thought of all the places I’ve been to a city that was scarred. A tunnel from the airport named after Ted Williams. The shops of Copley Square, the soaring Marriott hotel attached to it. Shaw’s supermarket across the street. The food stalls of Quincy Market (lobster bisque in a bread bowl, please). The quaint Italian bistros in the North End, where you can also get a great personal pie at the bar at Pizzeria Regina and top it all with the world’s best pastries down the street at Mike’s. Legal Seafood. The clam chowder at the Green Dragon pub. The Bobby Orr at Four’s on Canal Street, a steak tips sandwich to die for. Halftime Pizza across the street from the Garden, with the huge mural of the old Garden on the front of the counter. And I got there thanks to all those rides on the ‘T’ (the subway to you and me). Take the Green Line to Kenmore for Fenway and to North Station for the Garden, the Blue Line to the airport or the Red Line to Cambridge. There was still a pall over so many of those places last fall but it was lifting some and the Red Sox brought everyone together all summer and finally won the World Series. Then they brought their victory parade to a stirring halt at the finish line as Jonny Gomes placed the trophy on the ground draped in a “Boston Strong 617” jersey. Powerful stuff. The Red Sox knocked it outta the park again Sunday night with a stirring ceremony honoring the victims, the survivors and the first responders. We’ve learned time and time again how sports can be great unifiers for a community in times of tragedy. It played out in New York in the aftermath of 9/11 and we know it here first-hand too. For raw emotion, the Sabres’ shootout win over San Jose here in 2009 on the night after Flight 3407 crashed in Clarence was far more than a hockey game. I can still picture former managing partner Larry Quinn talking to reporters in the press box prior to that game and saying there was no chance it was going to be postponed because the team wanted the community to have some place to gather and mourn. The pregame moment of silence with the arena lights turned low was eerie and beautiful at the same time. And when the Sabres got a tying goal from Jason Pominville in the final seconds, the building erupted pretty much like it never has in any regular season game. The players felt it too. Just Perfect. The Bruins are back on the ice tonight in Detroit. Their city has reclaimed its marathon. I suppose you can fully harbor that old animosity for Boston teams again. Just remember the place those teams represent. Bravo, Boston.